Playfrank Casino is a fresh addition to the online casino world. We have no doubt they will be a bright shining star for a long time and recruit a loyal player base. It has a playful yet responsible design with clear colour. 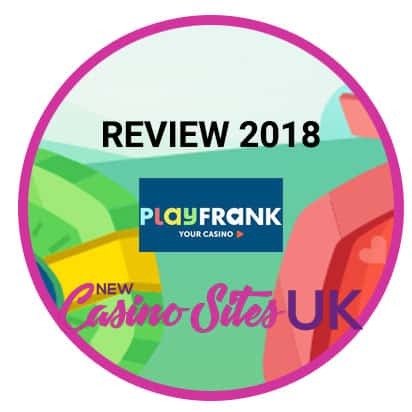 It feels cosy to visit Playfrank Casino, but that’s not the only thing we like about this new fresh casino site. Keep on reading to find out more about Playfrank Casino. If you like a lot of games to chose from you won’t be disappointed when playing at Playfrank. This new and fresh casino offers more than 1200 different games from the most popular game developers 2018. You will find everything from Planer of the Apes to the Emoji Planet. If you like table games but don’t always have the time to make the travel to a local-based casino you may want to check out Playfranks wide range of Live Casino and table games. They offer pretty much all you can think of, Oasis Poker, Black Jack, Roulette, Texas Hold’em and many more. If you want to go for the big win, you can always try for their twelve Jackpot Games. Playfrank is the home of game developers like NetEnt, MicroGaming, Evolution-Gaming, Play n Go and many more. If you’re looking for other brands that have these games, please visit our page listing other casino slot sites here. Playfrank understands the importance of an attractive welcome bonus, and this is great for you as a player. They offer a package of both deposit bonus and extra spins at one of the most popular games, Starburst. You also receive a percentage bonus on your second and third deposit. One unique thing about Playfrank is that they have something called Daily Challenges. This is a fun addition if you play often. They also offer tailor-made rewards for their players; you can get on your pick what kind of rewards you want to get. A fun addition to the old-fashioned reward system. The minimum deposit to take part of the bonus at Play Frank is £20. All gambling is aimed at persons who are 18+ years or older. We think one of the most important thins about a new casino is to make sure they have your prefered payment options and an easily accessible support. In this area, Playfrank doesn’t disappoint. When it comes to payment methods you can choose from, Visa, Mastercard, Skrill, Trustly and many more. The customer support is open 24/7 and always within reach of your fingertips. We have nothing negative to say about the support. Playfrank also does a good job listing the frequently asked questions and keeping them up-to-date. We think Playfrank brings something new to the market with Playfrank 2.0 and Daily Challenges. It also feels fresh and modern. With an increasing number of players coming from portable devices like mobile phones and tablets, the site adapts well to different screen sizes and portable devices. They are also a UK Licensed casino which is an extra safety for you as a player and almost a must when playing new online casinos nowadays. We can highly recommend Playfrank for both new users and more experienced players. Remember always to play smart and have a good time. Good luck at Playfrank Casino!